A Chicago police officer using the name “Danny Edwards” was exposed today by independent journalists after infiltrating Chicago Action Medical (CAM) for the last year. CAM is a collective that has provided first aid and urgent care since 2002 at progressive protests and demonstrations. CAM took the lead in organizing protester medical support for the 2012 NATO protests. “Danny Edwards” attended a 20-hour street medic training organized by CAM in March 2012. From March through May 2012 he attended many protests as a street medic in the lead up to and during the NATO protests. After that he occasionally emailed CAM members on and off of our email list soliciting information about upcoming protests. To our knowledge he did not provide any medical care as a street medic. After he was positively identified as a police infiltrator, CAM removed him from our email list and we are now notifying other medics and activists of “Danny’s” identity and our process. 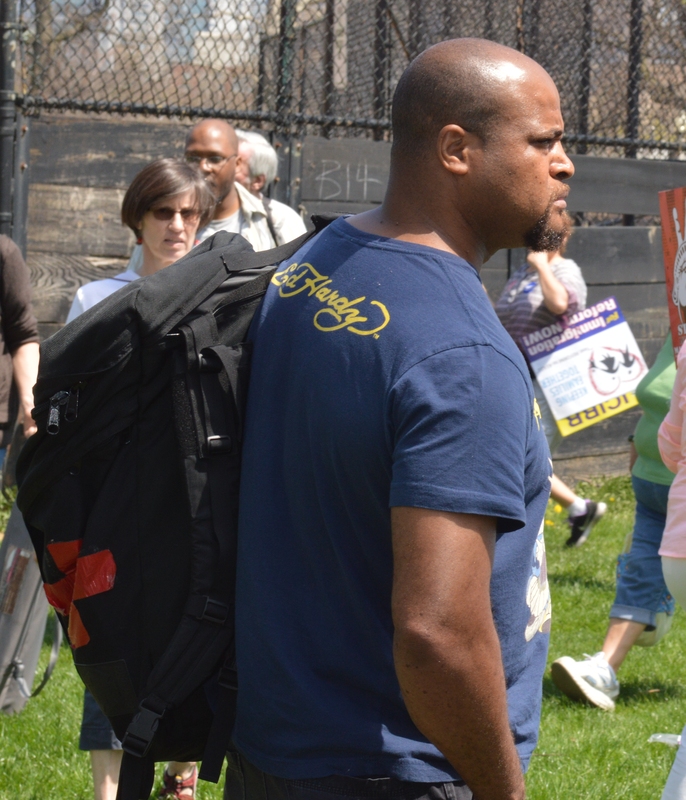 In early May 2012 a few members of CAM raised concerns with each other about “Danny Edwards.” Most alarmingly, a Chicago activist informed us that “Danny” had contacted him looking for information about unpublicized NATO protests. On other occasions “Danny” broke away from his street medic buddy to join black bloc sections of the NATO protests. In trainings and in practice, CAM stresses the importance staying with a buddy throughout an action. When “Danny” repeatedly broke these generally accepted guidelines, CAM members reminded him of our standards and asked him to remove his CAM insignia. As “Danny” continued to act in ways counter to CAM standards, concerned CAM members continued to offer him guidance, but also monitored his activity more closely and tried to prevent him from close contact with less experienced group members. We also reminded protest organizers about CAM’s open membership, and that only public information should be shared with the collective. We did not share our growing but unconfirmed suspicion with the broader group, because we believe a culture of concern keeps us safer than a culture of fear. We expected “Danny” to disappear after the NATO protests, and were surprised when he privately approached CAM members this spring asking for information about planned protests organized by groups including the Chicago Teachers Union. At this point we became aware of publicly available court records stemming from the NATO 3 trial naming “Danny” as a Chicago police officer. Independent journalists followed up with a thorough investigation, during which they photographed “Danny” at a protest and met him at his home. CAM believes that the CPD infiltrated CAM to attempt to gain information about protest groups. We do not have special access to information, but we do have a bond of trust with protest communities. The CPD may have believed that they could exploit that trust to map social networks, entrap someone, or sow fear and distrust. CAM stands against political infiltrators and informants. It is unconscionable that our society allows the expenditure of vast sums of money to fund these predators who undermine democracy. We applaud journalists, popular movements, and representatives who work to expose and change this sad state of affairs. We especially condemn the recent pattern of FBI and other law enforcement entrapment of impressionable, isolated, or inexperienced social and environmental justice activists. We stand in solidarity with members of the Muslim community who have experienced even greater targeting and persecution. We strongly caution radical and protest groups against making unconfirmed accusations that members are informants or infiltrators. Infiltrators are a real threat to our movements, but we believe that a greater threat is succumbing to the paralyzing fear of working under police surveillance. CAM has no plans to change our membership structure. We have a wide membership of varying experience levels, united by a common 20-hour training, enthusiasm for the work, and adherence to group expectations such as patient confidentiality and having a buddy while marked as a medic. There is absolutely a role in social movements for small closed groups of mutual trust. Unfortunately, small closed groups do little to protect the people on the margins of our movements who are frequently targeted. While we are always mindful of police surveillance, for us the lesson is to be loud, upfront, and transparent about who we are and what we are doing. Build connections across different segments of our movements. Reach out and support those new to or on the fringes of our movements. These are our strategies, and they have served us well for eleven years. For more information you can read the full article by Chris Geovanis and Steve Horn at http://www.truth-out.org/news/item/16488-undercover-police-officer-connected-to-nato-5-case-still-spying-on-protest-in-chicago. If you have any questions about CAM or undercover Chicago police officer “Danny Edwards”, or have had interactions with “Danny” you are concerned about, contact us at chicagoactionmedical@riseup.net.